(Nanowerk News) Most people see defects as flaws. A few Michigan Technological University researchers, however, see them as opportunities. Twin boundaries -- which are small, symmetrical defects in materials -- may present an opportunity to improve lithium-ion batteries. The twin boundary defects act as energy highways and could help get better performance out of the batteries. This finding, published in Nano Letters earlier this year ("Twin Boundary-Assisted Lithium Ion Transport"), turns a previously held notion of material defects on its head. Reza Shahbazian-Yassar helped lead the study and holds a joint appointment at Michigan Tech as the Richard & Elizabeth Henes associate professor in nanotechnology and an adjunct associate professor in materials science and engineering. Anmin Nie, a senior postdoctoral researcher in his group, conducted the study. Nie says that material defects, including twin boundaries, are naturally occurring and majority of the past research has focused on removing them from materials. "We look at the nanostructure of the battery materials that are out there," he explains. 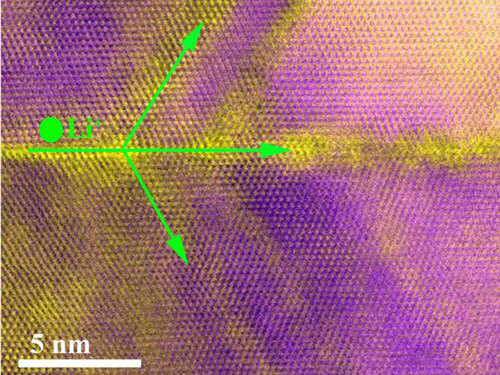 "We have noticed some defects, such as twin boundaries, that exist in these materials can be good channels that will help us to transport lithium ions." That movement of ions is key to making better, stronger batteries. Batteries power most of our gadgets. Shahbazian-Yassar says, "The focus over the past few years has been on rechargeable batteries -- most specifically the lithium-ion battery." That's because lithium-ion batteries are lightweight, pack a whopping punch of energy density, and their efficiency continues to climb. Like all basic batteries, ones run on lithium ions rely on shuttling ions from one place to another. Technically speaking, that's between the anode and cathode, and an electric current coaxes ions to shuffle between them. A low battery means there is less exchange happening between the anode and cathode. Twin boundaries could help hustle that exchange along or perhaps extend it, hopefully without losing battery life. Twin boundaries basically are mirror images, places in a material where one side of atomic arrangements reflects another. They often result while making a material, which shifts the atoms out of place a smidge. "Without a detailed view of the atomic arrangements, one might think the structure of electrode material is perfect, but then when you pay attention at the atomic level, you'll notice that these atoms are all symmetric with one plane," Nie says, explaining that the symmetry causes problems because it creates weak spots. At the same time, that symmetry is what provides a route for ions to travel along. Shahbazian-Yassar and his team received a grant from the Division of Materials Research at the National Science Foundation last fall to explore this and have now shown that a twin boundary acts as a highway for lithium ion transport. "Usually the available free space within the crystal is what ions use to move in or out of the electrode," Shahbazian-Yassar says, explaining that the space is like a crowded city with narrow streets and the ions resemble the moving cars. "If there is an accident, road construction, or simply traffic, cars can not easily pass through the streets -- similar phenomenon happens in batteries. The research team examined twin boundaries in tin oxides, but Shahbazian-Yassar says it's applicable in many battery materials. The next step is finding out how to optimize these defects to balance the mechanical integrity with the amount of twin structures. Finding that balance will be the focus of the researchers' next steps, and this new finding about twin boundaries lays the groundwork for improving lithium-ion batteries. Lithium ions need wide and open roads in order to shuttle in and out of the battery electrodes. Any obstruction to the moving ions will reduce the amount of energy or power extracted from a battery.